Win Maps is a free Windows 8 app to find directions. By using this direction finder app for Windows 8, you will be able to trace the route to be covered in order to travel from one place to another. It utilizes Google Places and combines it with Bing API to make it happen for you. The map supports road, Aerial, and bird’s eye view with option to zoom-in and zoom-out for making things easier for you. In addition, it also lets you search for places of interest nearby. 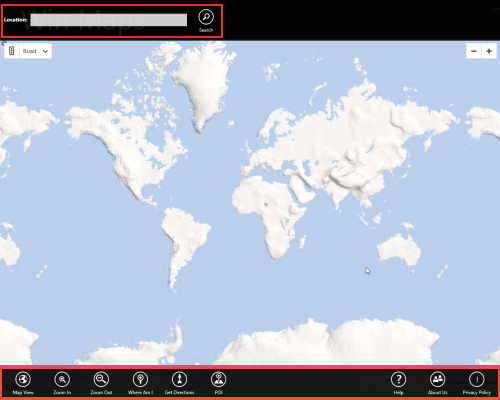 On launching Win Maps Windows 8 app for the first time, you will be shown the world map in center section of window, a search box on top-left corner, and a horizontal bar with different buttons at bottom. The search box above can be utilized to locate any place on the world map. All you need is to type the name of the location you want to find. On typing the initial letters the list of matching locations will populate for you to choose from. After entering the name of location; click on adjacent ‘Search’ button. Map View: Click on it to toggle between the three kinds of supported views. Zoom in & Zoom out buttons operate as per their names. Also, on the Top-right section are the ’+’ and ‘-’ buttons for same job. Where am I: On clicking over this button for first time you will be prompted about allowing the app to access your current location. After allowing it, the map will zoom-in or zoom-out to show you your current location on the map. Its was not 100% accurate, but can be of great help when in-between some journey. Get Direction: Click on this button and you will be presented a panel in the right section of the interface for entering the name of two places for finding the route. Then click on ‘Get Directions’ button. Soon after that the path to destination will be traced on the map. The best part is that you will be provided with brief route description in the panel to the bottom-left for gaining a better understanding. More details can be easily obtained by zooming-in on the path and having a look on the adjacent areas. Also, check out our posts on Map Apps, Travel Guide Apps, and Weather Apps. Next, click on install button and this 4.69 MB app will install within minutes. * Requires access to your internet connection and your location. 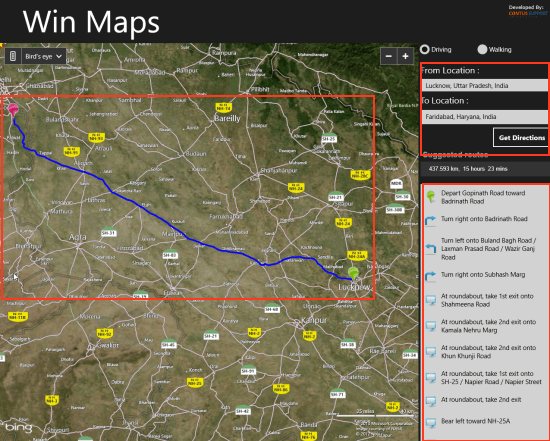 Win Maps Windows 8 app to find directions is a must to have on your Windows 8 machine. It’s quite useful and quite fun to operate. This program does not mark locations. Such as I wish to place a marker where my home is.